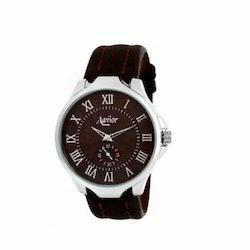 Counted as one of the renowned organizations, we are involved in offering top class Men Multi Functional Watch. Experts test the quality of these products on numerous quality constraints to safeguard their superiority and excellence. We hold expertise in providing a comprehensive range of Multi Function Watches. Our product is widely utilized for their robust nature and longer life. This multifunction watch for men highlights a black, round dial, encompassed within an aluminium case fitted with a crown. Arabic numeral markings are present on the dial, along with stick markings and three subdials. The strap, made of fabric, is black and gold in colour. Equipped with 5 ATM water-resistant depth, this watch is user-friendly. It comes with a 24-month warranty. For catering the variegated needs of our clients, we are deeply engrossed in offering a qualitative array of Stylish Women Multifunction Watch. - Multifunction dial indicating day, date and 24 hour time.